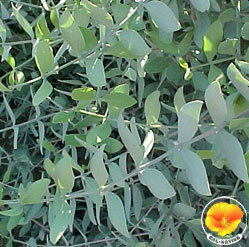 Evergreen, extremely tough, durable, tolerates exposures full sun, heat to part shade. Seed grown forms vary widely. Good wildlife food. Dark Gray-Green & leathery leaves. Slow to moderate growth rate. Very drought tolerant. Can be as large as 8' tall x 10' possibly larger. Densely branched. Foliage damaged in low 20s killed below 15f. Dioiecious. 5-5000' on gravelly slopes S AZ, Calif, Baja. Accepts pruning. Tolerant of adversity.